My friend, Mary Pat, gave me this book recently…in between trips-of-a-lifetime to amazing places like Bhutan and Peru and the Galapagos and multiple visits with family charitable projects in Africa…(her life is amazing). 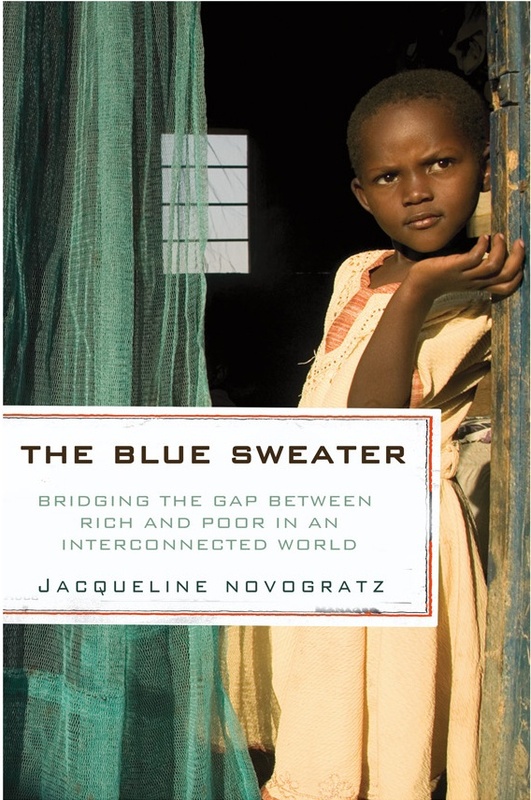 The Blue Sweater is subtitled: “Bridging the Gap Between Rich and Poor in an Interconnected World” and is a genuinely engaging read that kept making me go back and read parts over and over. I am a guy who never folds a page, but my copy of this book is dog-eared throughout and I’ve even written notes in the margins (fearing the retribution of my second-grade teacher, who would’ve had a fit to see someone writing in a book). Author Jacqueline Novogratz is also the founder of The Acumen Fund, and she understands—and opens understanding—about issues of global poverty in ways that have, from this point forward, changed my thinking. My eyes glaze over at discussions of finance. I used to rebel against higher math, and math in general, so conditioned myself (and I’m not proud of this) to simply decide I didn’t understand. Now don’t get me wrong, this is no economics textbook. It is a travel-filled memoir of an amazing woman. She began as a young international banker, and is today one of the boundary pushers in the world of micro-loans. Through personal experiences working in diverse regions with impoverished communities (that make great story chapters) in the favelas of Brazil, the Cote d’Ivoire, Nairobi, additional areas of Kenya, India, Pakistan, and most affecting, pre- and post-genocide Rwanda, Novogratz opens doors with the investment of care and comprehension as much as dollars. The women with whom she shares dreams, and the defeats and victories of an outsider trying to be effective, (the crux of the issue) are riveting, and what has shifted my thinking. The best-intended charitable projects often miss the mark and peter out, and some of Jacqueline’s discoveries at first seem like tough love, but prove so much more appropriate than simple charitable donation. Throwing money at a problem is never the answer…though money is the linchpin for so much. I am so glad this book was given to me—I probably never would have picked it up on my own—and when a book serves as a line of demarcation: I had these beliefs BEFORE reading this, and they have changed SINCE reading it…that is exactly why writers write.